Texas Freckles: Too much fun to blog. Too much fun to blog. 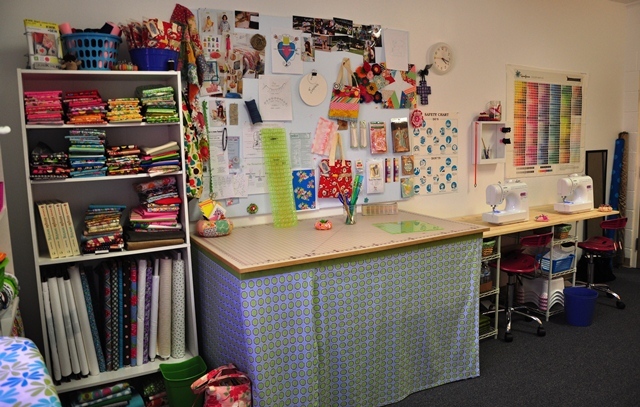 This is my new sewing studio! 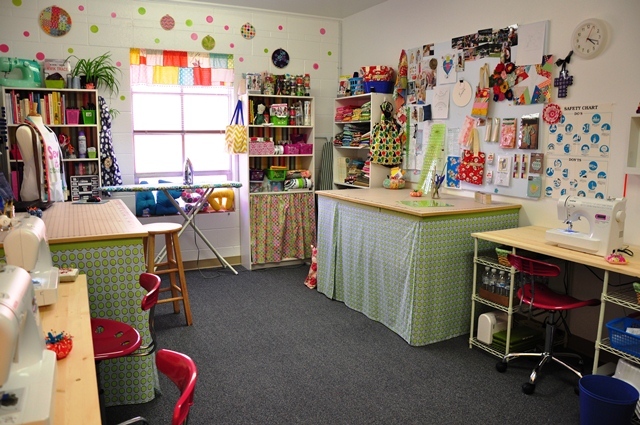 I finally did it; I leased a space and opened a sewing studio where I teach sewing to kids and adults! The studio is very near my home in an office suite. The building I'm in is actually an old church building and all of the classrooms have been converted to office suites. I signed the lease in the middle of May and started teaching the first week of June. The studio is set-up for four students at a time and I have two large cutting tables and two ironing areas. This summer I put together sewing camps for kids and created all the patterns and curriculum myself. I had seven camp sessions of four days each. There were a lot of kiddos in here this summer and I had a great time teaching them. Now that school is back in session, I've got some adult classes going during the day and a kids class after school one day a week. Marketing is not my thing, so I'm still just operating via word-of-mouth or simply by people who search for sewing classes in the area online. It's been enough to keep me busy and pay the rent, so I'm thrilled! By moving the sewing classroom out of my home, I got my sewing room back to myself and I've been working on some changes in there as well. I've got more organizing to do, but I'll share some photos soon. So, I haven't been blogging, but I've been sewing. Constantly! I've even been doing some draping and pattern drafting to make garments for myself. All this in addition to my Master Gardener certification hours and I've had a busy summer. I'll try to blog again soon, but right now, I'm ready to go home. I had three classes today and a meeting about making quilts for a school auction. This workin' girl is tired! Congratulations on your new studio. I look forward to reading about what you've been sewing. Congratulations! That will really keep you busy! I hope you can keep your love of sewing and sew as a business, too. Many people do, so you probably can! Best Wishes for a great year!!! So glad you're back. Which that I lived closer so that I could take a class! Oh my goodness! 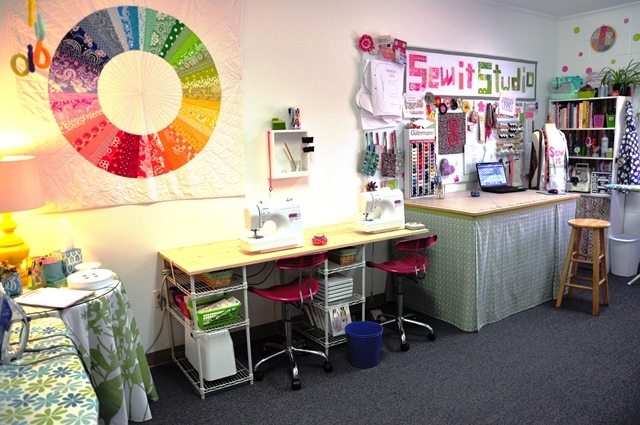 I want to come sew in your space too! It looks quite fun and encouraging with all the pretty colors! Congratulations! Fantastic! Sounds like a dream come true. Lovely studio. Well done girl. I totally understand blogging is a bit on the back wagon. Still have you in my side bar and will pop in whenever you have time to say hi. You go girl! Congratulations! You are giving me hope that I can work doing what I love....it looks fabulous! I imagine the kids love all of the color in your studio not to mention the adults. I love that color wheel! I've been wondering what happened to you. Glad you are well and keeping so busy doing something you love! Will look forward to your next post when you find the time. Congrats on making your dream come true! Congratulations! What an exciting endeavor! Nice to hear from you Melanie! Sounds like you've had an awesome Summer.